Library Viewer – allows you to quickly view more than 600 png images and swf animations organized in 19 folders. The current folder lineup includes: Actuators, Boilers, Buttons, Chillers, Coils, Compressors, Dampers, Ducts, Fans, Filters, Icons, Misc, Pipes, Pumps, Sensors, Systems, Valves, VAV Boxes and Windows. Image attributes include name, filesize, creation date and the ability to view as thumbnail or full size. Recent Additions – provides a convenient listing of the last 24 items posted to the library. Graphic Requests – a full featured, easy to your service that lets you submit an image request to our developers and graphic artists. This service allows you to describe your request and conveniently upload examples or links to your concept. An active log of past requests is included in the service allowing you to see the details and status of previous graphic requests. 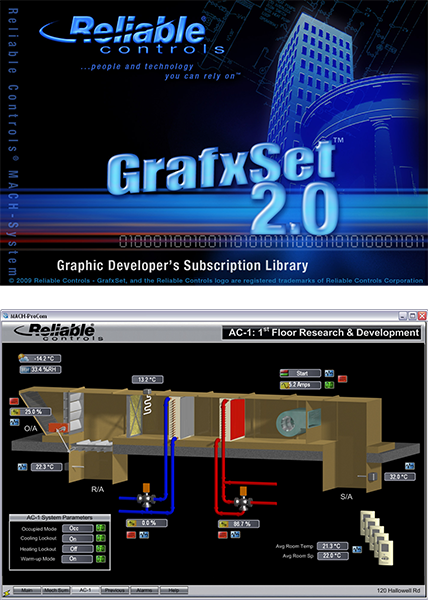 My GrafxSet – using your subscription product key as a password, access this protected area to download the entire GrafxSet library, renew your subscription, view and submit graphic requests, view available updates to your library, view your entire library, and view your library download history. The My GrafxSet service remains accessible even after your subscription lapses. In this situation, the only service that remains active is the renew subscription service.